Elgin Sweeper has partnered with RoadBotics, Inc., to offer Florida’s 400-plus municipalities the ability to collect road condition data during sweeping operations using Elgin Sweeper street sweepers, like the Elgin Pelican broom sweeper. Elgin Sweeper Company has partnered with RoadBotics, Inc., one of the country's leading road assessment companies, to offer Florida's 400-plus municipalities the ability to collect road condition data during sweeping operations, exclusively using Elgin Sweeper street sweepers. The partnership aims to help local government officials managing road maintenance budgets - while facing mounting pressure from citizens to address potholes and other poor road conditions - to make data-driven road improvement decisions. According to Mike Higgins, vice president and general manager at Elgin Sweeper, the partnership with RoadBotics will enable many of the company's municipal customers across Florida to receive important data about the conditions of their roads as they sweep. "Our customers in Florida deploy Elgin Sweeper products year-round to keep their streets clean of debris and sand. These sweepers traverse every road of each municipality on a regular basis. By applying RoadBotics' technology, we turn each sweeper into a mobile data collection platform that generates a detailed pavement assessment for our customers' entire road networks. Street sweepers have always been essential tools for improving water and air quality, and with the RoadBotics partnership, our sweepers will now also help Florida communities improve the streets themselves," Higgins said. Street sweepers have always been essential tools for keeping streets clean and improving water and air quality, and with the RoadBotics partnership, Elgin Sweeper’s products will now also help Florida communities improve the streets themselves. Mark DeSantis, RoadBotics' CEO, described the partnership with Elgin Sweeper as a major step forward in public infrastructure management. "More than 100 local governments across the United States have switched to our AI technology to assess their road networks because they want the reliable and objective condition data our AI platform generates. Typically, a municipality needs to wait for our team of technicians to arrive in their community to complete data collection. Now, a municipality can become a subscriber of our technology and conduct a pavement assessment immediately using Elgin Sweeper's fleet of street sweepers. 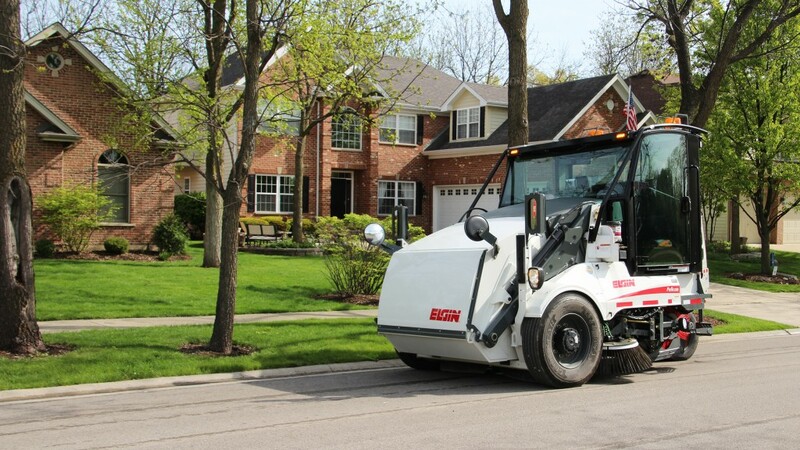 With this partnership, Elgin Sweeper's products will keep streets clean while simultaneously providing city officials with critical data about the conditions of their roads and infrastructure. It's a win-win," DeSantis said. RoadBotics' pavement assessment technology works by mounting a smartphone to the windshield of a vehicle - in this case, a street sweeper. The smartphone collects images of the road surface using the company's proprietary RoadSense app as the vehicle travels the roads. The data is then analyzed using cutting-edge machine-learning technology, which identifies road surface damage such as potholes and cracks and results in a detailed, meter-by-meter pavement assessment of the entire road network. Government public works officials then use this data to prioritize pavement maintenance in their community (see an example of a RoadBotics pavement assessment here). RoadBotics’ pavement assessment technology works by mounting a smartphone to the windshield of a street sweeper, turning the sweeper into a mobile data collection platform generating a detailed pavement assessment for a municipality’s entire road network. "Elgin Sweeper is committed to getting smart city technology, like RoadBotics, into the hands of our municipal customers in Florida - to help them achieve their mission to provide safe roads for their residents," Higgins said. "We will be leveraging the knowledge and expertise of Environmental Products Group, our local dealer, to execute this initiative. Roll-out to the broader United States is expected to follow initial deployment to Florida." "With Elgin Sweeper's products collecting data while sweeping, more municipalities will have a transparent view into the condition of their roads, and in the future, much more of their infrastructure," DeSantis said. "Such transparency represents a revolution in the way we are able to provide safer roads and infrastructure for millions of people each day. It's an ambitious goal, but Elgin Sweeper is the ideal partner to make it a reality." Images of the road surface are collected using RoadBotics’ proprietary RoadSense app, and the data is analyzed to identify road surface damage such as potholes and cracks. So much rides on tires that manufacturers are constantly improving them in a variety of technically fascinating ways providing buyers with the best performance and durability for specific machines and applications. Here are some recent updates to tires for construction equipment. Automatic Greasing Systems specialist FLO Components Ltd.announces the winner of the Lincoln 1844 PowerLuber Grease Gun Giveaway Contest. Gabriel Lopez, Marketing Specialist at FLO announced; "Congratulations to our winner - Matt Wilson. Matt is part of the team at Knott Construction Ltd., a proud second generation, family owned business in Meaford, Ontario. Matt's name was drawn randomly from all eligible entries on March 29 in the FLO NHES 2019 Booth and he successfully answered a skill testing question." Keith runs the business with the help of his two sons, Tyler, 32, and Justin, 31. The Kitchen trio are known within their community as the go to guys for any mobile tire needs; from skid-steer tires and tractor tires to off-road mining truck tires and Caterpillar's 980 loader tires, the team at Keith Kitchen Full Service Tire can service it all. Camso has launched its new Steel over-the-tire (OTT) track solution, confirming its leadership as the industry one-stop source for all skid steer tire and track needs. Groeneveld (part of The TimkenCompany) announced a new range of innovative OEM lubrication systems that sets itself apart as a brand-new concept reshaping the auto lube market. Continental is presenting its new ContiLogger consultancy concept at bauma. ContiLogger incorporates tires, hardware, software and data in an innovative service concept. This allows Continental to link end users with Continental's expertise even more closely. Continental is further extending its tire portfolio for the earthmoving industry. The technology company recently launched a new compound for its RDT-Master for the use on Rigid Dump Trucks. The cut-resistant compound was developed for rough and abrasive applications where tires have to withstand sharp gravel, rocks and stones. Winnipeg Richardson International Airport recently introduced 'Otto', the first autonomous airport snowplow in North America. The plow is the result of a partnership with Manitoba companies Northstar Robotics Inc. and Airport Technologies Inc. (ATI). Bridgestone Americas, Inc. is expanding its popular Firestone VersaBuilt All Traction (AT) radial tire line. Designed primarily for loaders and graders, the new Firestone VersaBuilt AT 14.00R24 tire is engineered to provide improved traction, versatility and dependable performance in a variety of environments, helping deliver improved productivity on the jobsite. Thunder Creek Equipment has expanded its multi-tank platform of diesel fuel hauling solutions to include a new medium-duty truck body – the Multi-Tank Upfit – that can haul bulk diesel on the road without requiring a CDL or HAZMAT endorsement (Title 49 (CFR49) – local regulations may apply). Each truck is outfitted with eight independent 115-gallon tanks (920-gallon total capacity) that are only connected when a common manifold is opened at the pumping station. Sears Seating, a manufacturer of off-road and over-the-road suspension seating for over 160 years, announced their exhibition at Bauma 2019, the largest construction trade fair in the world. Magnum Trailer & Equipment Inc., a manufacturer and service provider for heavy duty trucks and trailers, has completed its first install of snow plow rigs for two of Fort Garry Industries (FGI) Western Star 4700 trucks. FGI supplies hundreds of plow and spreader rig ups every year for snow and ice removal throughout Western Canada. Magna Tyres Group is expanding its worldwide network of offices and distribution, starting with an office near Toronto, Ontario. This opens up an entire new market which makes it possible for even more clients in Canada and the US to acquire premium quality Magna Tyres products. Michael de Ruijter, CEO of Magna Tyres Group, comments: "We took a great deal of care in choosing this location for our new office. It will further strengthen our commitment to all customers in the region and is an opportunity for close daily cooperation." FLO Components Ltd. will be exhibiting its new SM (Small Machine) Luber at the National Heavy Equipment Show 2019. This line of automatic greasing systems is designed specifically for compact machines where space is at a premium. Enerpac has introduced a new XC-Series Cordless Torque Wrench Pump that is ideal for maintenance applications in the PowerGen, Oil & Gas and MRO markets. This portable pump is ideal for remote locations, sites that do not have access to power or where having electric cords could cause trip hazards. Shell Rotella has introduced a line of heavy duty greases for trucks, tractors, construction equipment and more. Fuel consumption – how low can you go? The diesel engine has become a highly efficient power source – but how much further can it be developed? In this article, Dr. Staffan Lundgren discusses whether the humble engine has a future, and if so what it looks like. EquipmentWatch, the world leader in data, software and insights for the heavy equipment industry, has announced a new suite of fleet consulting products now available to contractors and equipment professionals seeking efficient solutions to large-scale fleet problems. These solutions cover all major equipment types across construction, lift & access, agriculture, and commercial truck (through an exclusive partnership with Price Digests). Automatic Lubrication Systems specialist FLO Components Ltd. continues to expand its resources to better serve construction, road building, aggregate, trucking, manufacturing and processing companies in Manitoba and Ontario. We are pleased to announce the appointment of Mike Munroe as Territory Sales Manager - Southern Manitoba & Northwestern Ontario. Yokohama Tire's new RL47A E-4 radial tire for rigid frame dump truck applications is now available in size 27.00R49. The RL47A, designed to handle longer high-speed hauls, is offered in four different compound options: CP (cut-protected), REG (regular), CP-S (special cut resistance) and HR (heat resistant). Michelin North America, Inc., is introducing the first-ever "3-star" 18.00R33 tire on the market for rigid dump trucks (RDT). A star rating is the industry's indicator of load capacity for a given dimension as defined by the Tire and Rim Association. The new MICHELIN XTRA LOAD GRIP and the MICHELIN XTRA LOAD PROTECT will allow users to increase load capacity by 11 percent(1) or accommodate more distance per hour to maximize productivity. FLO Components Ltd. has announced its introduction of the new SM Luber. The SM Luber was designed as a compact yet powerful and economical automatic greasing system, specifically for any compact machine where space for attachments is at a premium. Day two of Electra Mining Africa focused on the launch of new technology and innovations at the show. More than 60 products were reviewed across three categories. Kal Tire's Gravity Assist System (GAS) received top honours in the category of International Mechanical and Technology Innovation, mainly for its simplicity and effectiveness. Thunder Creek Equipment has expanded its multi-tank platform of diesel fuel hauling solutions to include a new medium-duty truck body — the Multi-Tank Upfit — that can haul bulk diesel on the road without requiring a CDL or HAZMAT endorsement (Title 49 (CFR49) - local regulations may apply). Each truck is outfitted with eight independent 115-gallon tanks (920-gallon total capacity) that are only connected when a common manifold is opened at the pumping station. It is a real headache, as well as a potential cause of delay, when vehicles such as excavators or dump trucks cannot be located on huge construction sites. Where exactly are my vehicles? And how many hours have they been in operation? It is questions like these that fleet operators in the construction industry and agricultural sector have to be able to answer if they want to deploy their vehicles as efficiently as possible. This is where the Bosch asset tracing solution – or Bosch TRACI for short – comes into its own. The robust, IoT-based connectivity solution can be easily retrofitted to existing vehicles. "Bosch TRACI provides all the relevant data needed to enhance the efficiency and utilization rate of any vehicle fleet," says Jan Philipp Büchner, the product manager responsible for Bosch TRACI. "It helps keep wait, search, and transportation times to a minimum." The Bosch solution comprises a sensor box, cloud-based evaluation software, and a wide array of digital services. Danfoss Power Solutions is proud to offer differentiating wheel loader solutions and subsystems, which are proven at our global Application Development Centers (ADCs). The wheel loader subsystem solutions are developed and tested under real-world conditions at our ADCs and are proven to increase productivity and uptime while lowering total cost of ownership by improving efficiency. Our team of experts is in place to assist OEMs introducing their wheel loaders to market quickly. Eliminate the guesswork and save time ordering maintenance parts for your Generac Mobile Products equipment with pre-boxed Service Maintenance Kits designed for your machine. Service Maintenance Kits keep your equipment in top working condition and are warranty-compliant. Safety is the primary concern for users of all lifting and access equipment. This is especially so when working in the vicinity of electrical utilities and other charged properties. EquipmentWatch, the industry standard for ownership and operating cost data, announces the introduction of light duty truck models to its Rental Rate Blue Book and Internal Charge Rate products. The update represents the vast majority of truck manufacturers and models found on any given construction site, including Ford, Chevy, Dodge, Nissan, Toyota and more. When an engine fire destroyed a log handler at Cameron River Logistics (CRL), Andrew Moore and his team decided it was a chance to rethink their original purchase decision. JLG Industries, Inc. has announced the availability of 33- x 16-inch turf tires. These tires are designed to be turf-friendly and provide excellent traction and floatation with minimal ground disturbance. Turf tires will be available as an option for the G5-18A Telehandlers in August 2018. Bridgestone Americas is investing $12 million to expand production to include popular off-the-road (OTR) tire sizes at its Bloomington, Ill., plant. The plant will produce multiple sizes and patterns in 29-, 33- and 35-inch OTR tires, which until now have only been produced by Bridgestone in Japan. The Brawler Solidflex HPS solid tire line, from Trelleborg Wheel Systems, has been selected as the Original Equipment Manufacturer (OEM) solid tire option for Cat Medium Wheel Loaders and Small Wheel Loaders from Caterpillar Inc.